The Visitor Center has some very informative exhibits, plus the award-winning 15-minute film, A Year in the Desert. A desert garden just outside the Visitor Center building provides a quick look at some of the vegetation typical of the 600,000-acre park, with the species identified. 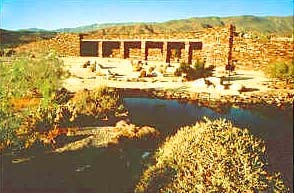 The desert garden includes a pupfish pond. Pupfish evolved from conditions during the Ice Age to today's precarious existence of fish in the desert. These pupfish can thrive in fresh water or water nearly as salty as the ocean, and they can survive temperatures from near freezing to as high as 108 degrees Fahrenheit. When the water gets too warm or too cold or nearly dries up, these fish burrow in the mud at the bottom of the pool. There's another pupfish pond near the Palm Canyon Trailhead in Borrego Palm Canyon Campground. There are more wonders in this desert than anyone could see in a lifetime, including wildflowers, which usually start blooming in force in late February or early March. Varieties of cactus bloom at all elevations but at different times, and for wildflower buffs they are the real prize. They tend to be "specimen" blossoms in colors ranging from red to yellow, and green. Other plants, such as the red chuparosa and the yellow brittlebush, show themselves as a mass of tiny flowers covering the surface of a shrub, or even a field of shrubs, or, in a good year, a broad expanse of pink sand verbena. It is often impossible to predict how desert plants will respond to the timing and amounts of rainfall and the fluctuations of temperature. Open 7 days a week 9:00am to 5:00pm October 1 through May 31 and on weekends and holidays only from June 1 through September 30. We also encourage you to sign up for email notifications through our non-profit partner, Anza-Borrego Foundation.